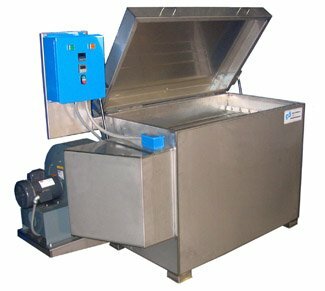 Our industrial Top Load Dryers are designed for use in industrial applications where high production requirements and operating efficiency are the primary criteria. Foam-insulated, double-wall heavy-duty stainless steel construction ensures quick heat up time and long equipment life. The air in the drying chamber is continuously circulated with a high velocity blower and reheated, so unlike some dryers that exhaust-large amounts of hot air into the room, these drying systems are energy efficient. All models are available with rod-style rack hangers or a removable bottom work rest. For other dryer configurations, return to our Dryer Overview Page . 30" x 25" x 30"
45" x 25" x 30 "
57" x 25 " x 30"
64" x 42" x 41"
77" x 42" x 41 "
89" x 42" x 41 "